Even after living in the same home in the same neighborhood for almost 4 years, it never ceases to surprise me with something I haven’t experienced. 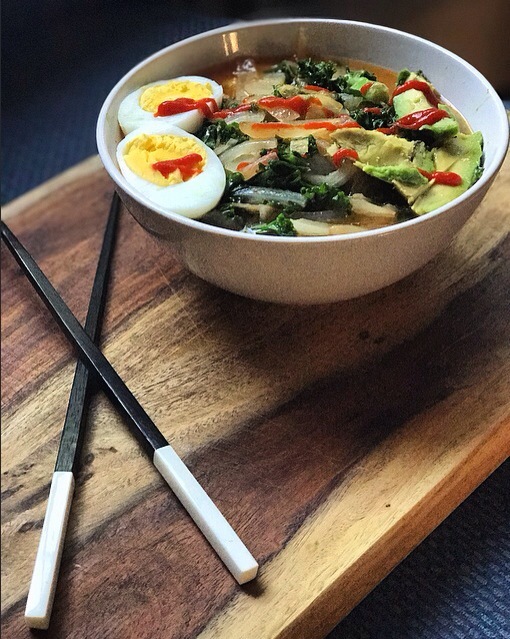 My craving for real, homemade ramen combined with my current girl crush on the amazing Candice Kumai lead me just a mile away to the Asian market. In the market, with very little English on the signs or packaging, I managed to find my way and grab what I needed…aside from getting in trouble for taking a picture (typical Rachael move) by the mama bear of the store. I was inspired by Candice’s recipe which you should totally check out, but I changed mine up quite a bit, which you can find below! -In a large pot, bring your sesame oil to a medium heat and sauté your sliced onion for about 8 minutes. -Add your miso paste and mix well. -Add your water and whisk in the sriracha. -Add kale to your soup mixture. -Meanwhile, boil your eggs for about 13 minutes. -In a medium pot, cook your noodles according to the instructions, then drain when ready. -Grab two bowls and evenly divide the noodles. -Pour soup over each bowl of ramen. -Cut your eggs in half and place one egg on each bowl. -Serve with chopsticks and some air conditioning. Candice says that less than two tablespoons of spice is for boring people, so I went all out and even drizzled some extra sriracha on top. You know, because I’m badass like that (I say while cradling a chihuahua in bed). What I love about this recipe is that while it is super easy and incredibly cost effective to make, it doesn’t skimp on flavor and the “wow factor” presentation at all. 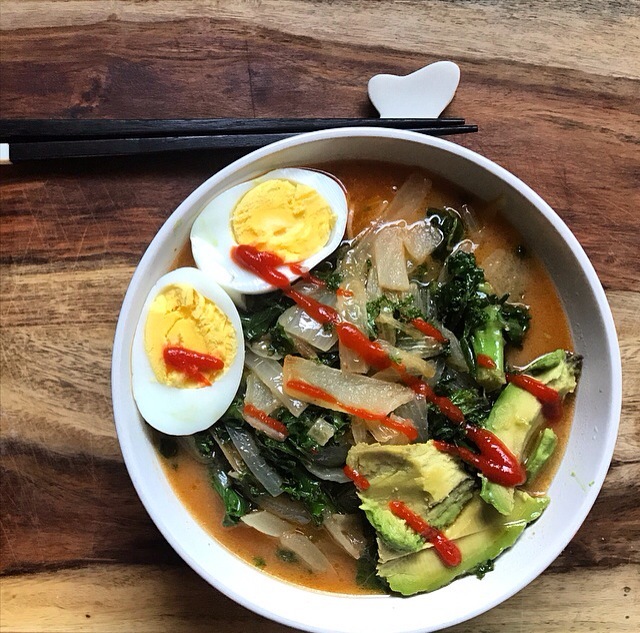 If you change up your recipe at all, don’t forget to leave a comment below letting me know how your ramen adventure went!